Students who survived the Parkland, Fla. shooting helped start the ‘March for Our Lives’ movement, which gathered more than a million people to streets across the country to push for tighter gun control laws. Will it inspire change? Four days after the Feb. 14 shooting at Marjory Stoneman Douglas High School that left 17 people dead, a few student survivors decided it was enough and promised to do all their could to change our existing gun laws. Since that very moment, the were defiant, outraged and determined. These Parkland students created the “Never Again” campaign —a student-led gun control organization that advocates for tighter regulations to prevent gun violence— and announced a “March For Our Lives” for March 24 to talk about gun control. On that date – March 24, 2018 – thousands of students, teachers and supporters gathered in the nation’s capital Saturday for the March for Our Lives rally, an event part of more than 800 that took place in the United States and other major cities worldwide. They carried signs, chanted and demanded action against gun violence. They implored people to register to vote, and pleaded with the lawmakers to take care of children. They gave a face to a powerful movement advocating for change. For years, promises for tighter gun control laws have been made after each mass shooting incident in schools across the country. The Columbine High School massacre was at the time, the worst high school shooting in U.S. history and prompted a national debate on gun control and school safety, as well as a major investigation to determine what motivated the gunmen. But since Columbine in 1999, there have been 25 fatal, active school shootings at elementary and high schools in America. They have become an anomaly. Yet, nothing has made the US Congress and Senate to revise and change loopholes for stricter gun control measures in the existing legislation; not even the 2012 shooting at Sandy Hook Elementary School in Connecticut in which 20 young children and six adults were killed. But after Marjory Stoneman Douglas High School shooting we’re starting to see change. From organizing the March for Our Lives to the rallies on Saturday that included speeches, rousing and passionate, people are starting to listen. A rising generation, extremely savvy about the workings of the American media, is talking and most people are listening. A silence has been broken, forcing the majority-governing GOP to take steps towards decreasing gun violence in the country. In Florida, Gov. Rick Scott signed a $400 million school safety bill in response to the Parkland tragedy. Though the bill isn’t what many of the shooting’s survivors –or the school’s students– wanted, it marked a break of the state with the National Rifle Association and the group’s powerful lobbyists. It raises the minimum age to buy rifles from 18 to 21 and creates a waiting period on sales of weapons. The hundreds of thousands of teenagers and supporters, rallying across the United States for tougher laws to fight gun violence made the US attorney general propose a rule that would effectively ban bump stocks, devices that turn semi-automatic weapons into fully automatic weapons. But the changes are just baby steps in a long road ahead in US gun policies. Under US law, machine guns are officially banned. However, semi-automatic rifles, like the AR-15, are legal because of their lower rate of fire. This, and other growing loopholes, make our gun laws weak. Under federal law, private-party sellers are not required to perform background checks on buyers; whether at a gun show or other venue. They also are not required to record the sale, or ask for identification. This requirement is in contrast to sales by gun stores and other Federal Firearms License holders who are required to record all sales and perform background checks on almost all buyers, regardless of whether the venue is their business location or a gun show within their state. And there are more and greater loopholes, and they should be addressed. The “March for Our Lives” events on Saturday broke the silent of the majority who advocate for these loopholes to be fixed. This majority, that does not agree Americans need assault rifles to hunt nor want to arm teachers at school, drew massive crowds in cities across the country, making the march the largest youth-led protests since the Vietnam War era. 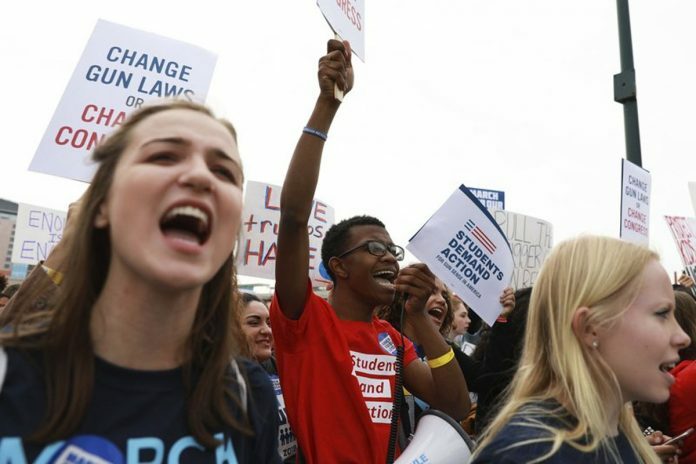 The message at the different rallies was consistent, with demonstrators vowing to vote out lawmakers who refuse to take a stand now on gun control as they see the government has “extremely failed” to protect students [and people] from gun violence through the years. Will the ‘March for Our Lives’ demonstrations inspire change? To be continued… after the next mid-term elections.